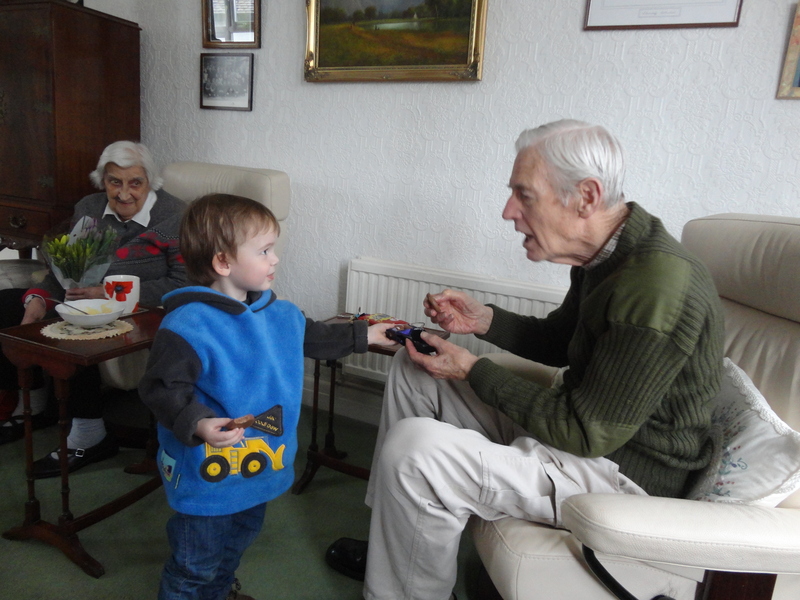 Alfie stayed the night and all through breakfast this morning was talking about Millie’s visit. 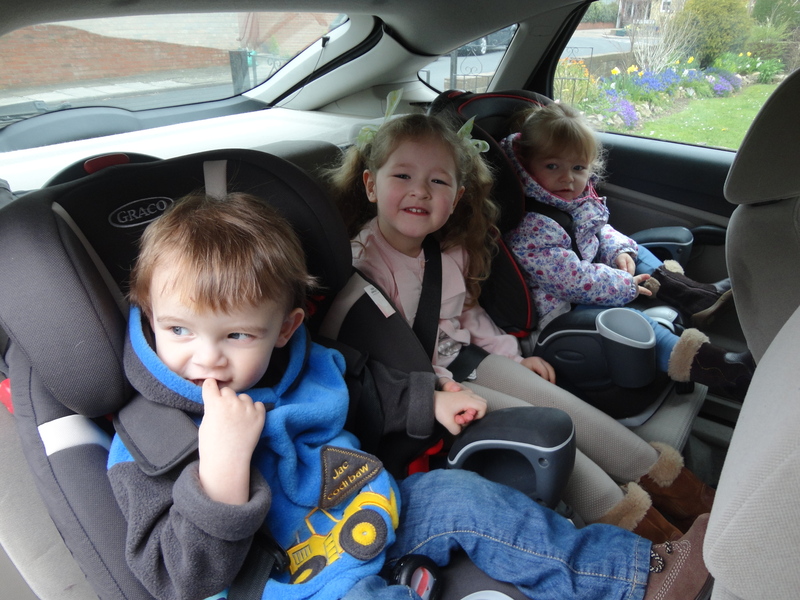 He loves his Monday get togethers with his two cousins. He was standing on the box near the window when she arrived and the expression on both their faces as they saw each other spoke volumes of the love and friendship they share. It was magical. 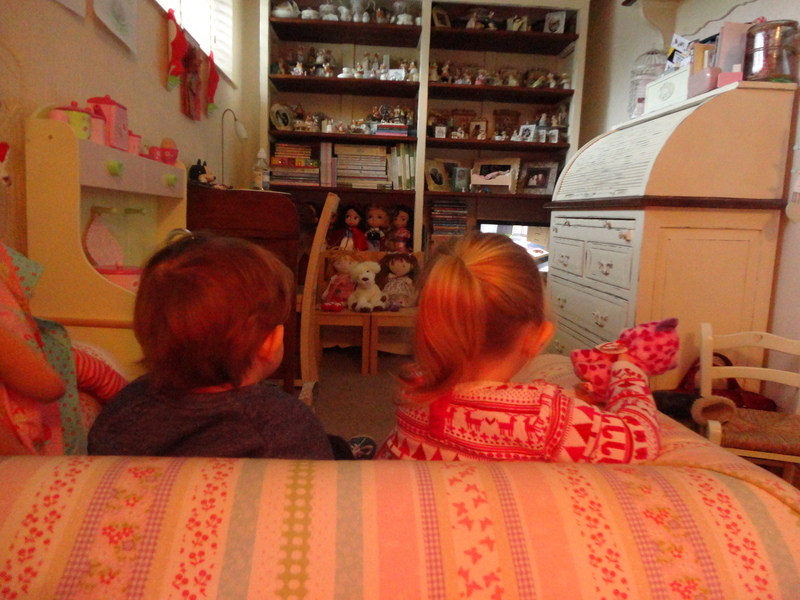 They spent the morning playing together in their special part of our home. The latest ‘must play’ game is a game they call ‘Penguin Race ’. 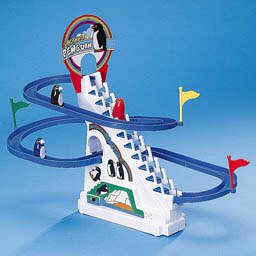 It’s a bizarre little game where a group of three penguins climb a steep staircase only to slide round and start again. I bought it cheap on Amazon; UK HOTdeals recommended it. 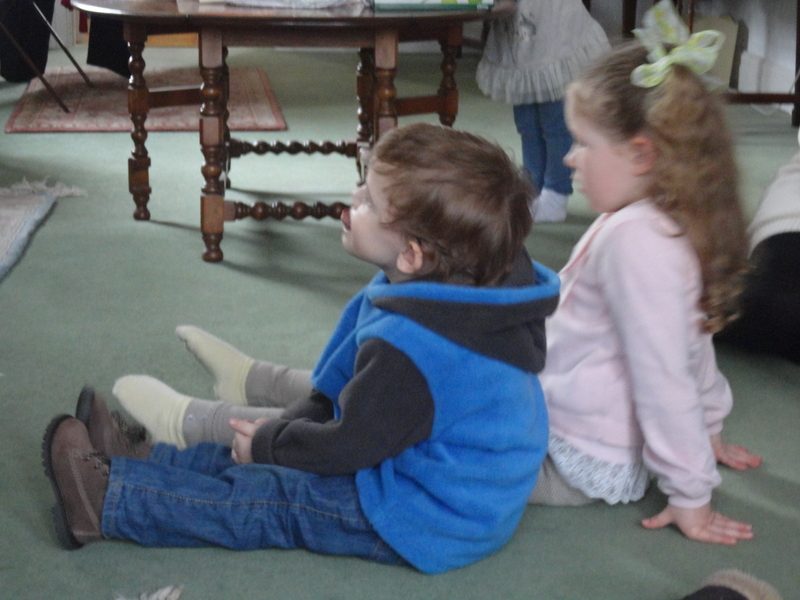 The kids absolutely love it although the repetitive tune does grate a bit after the first two and a half hours. 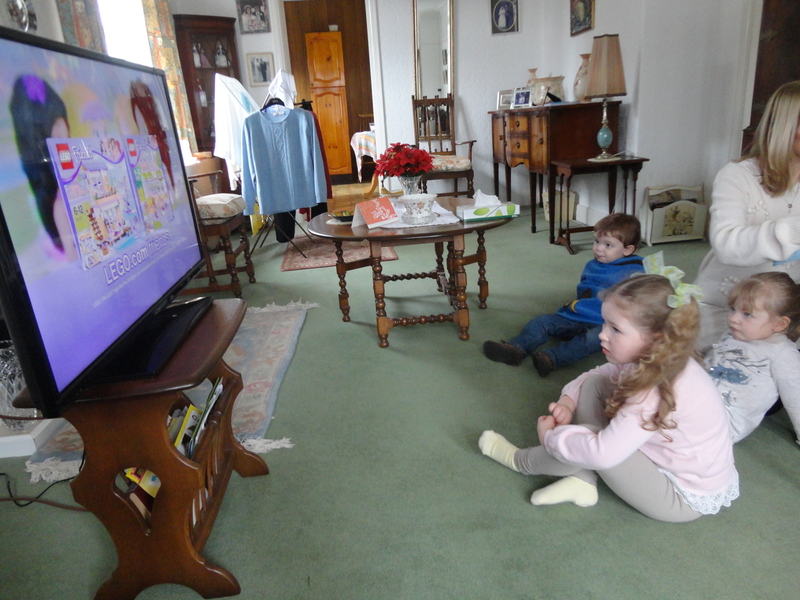 After playing they settled down to watch UP! – to my mind the best film ever made without a shadow of a doubt. Up is a 2009 American computer animated produced Pixar and released by Disney. The film centres on an elderly widower named Carl Fredricksen and an earnest young Wilderness Explorer Russell. By tying thousands of balloons to his home, 78-year-old Carl sets out to fulfil his lifelong dream to see the wilds of South America and to complete a promise made to his lifelong love. Docter. The producer began working on the story in 2004, which was based on fantasies of escaping from life when it becomes too irritating. He and eleven other Pixar artists spent three days in Venezuela gathering research and inspiration. The designs of the characters were caricatured and stylized considerably, and animators were challenged with creating realistic cloth. The floating house is attached by a varying number between 10,000 and 20,000 balloons in the film’s sequences. Up was released on May 29, 2009 and opened the 2009 Cannes Film Festival, becoming the first animated and 3D film to do so. The film became a great financial success, accumulating over $731 million in its theatrical release. Up received critical acclaim, with most reviewers commending the humour and heart of the film. Edward Asner was praised for his portrayal of Carl, and a montage of Carl and his wife Ellie aging together was widely lauded. The film received five Academy Awards nominations, including Best Picture making it the second animated film in history to receive such a nomination (and Pixar’s first Best Picture nomination), following Beauty and The Beast. (1991) – this is the favourite film of the lady of the house. Carl Fredricksen is a shy, quiet boy who idolizes explorer Charles F. Muntz. Muntz has been accused of fabricating the skeleton of a giant bird he claimed to have discovered in Paradise Falls, and vows to return there to capture one alive. One day, Carl befriends Ellie, who is also a Muntz fan. She confides to Carl her desire to move her “clubhouse” — an abandoned house in the neighbourhood — to a cliff overlooking Paradise Falls. Carl and Ellie eventually get married and grow old together in the restored house, and they planned to have children, but Ellie was diagnosed as infertile, so Carl wanted to fulfil their promise of travel to South America. They repeatedly pool their savings for a trip to Paradise Falls, but end up spending it on more pressing needs. An elderly Carl finally arranges for the trip, but Ellie suddenly becomes ill and dies. Some time later, Carl still lives in the house when he accidentally injures a construction worker over damage to his mailbox, and a court orders him to move to a retirement home. However, Carl comes up with a scheme to keep his promise to Ellie: he turns his house into a makeshift airship, using thousands of helium balloons. Russell, a young Wilderness Explorer becomes an accidental passenger in his effort to earn his final merit badge for assisting the elderly. After surviving a thunderstorm, the house lands near a ravine facing Paradise Falls. Carl and Russell harness themselves to the still-buoyant house and begin to walk it around the ravine, hoping to reach the falls before the balloons deflate. They later befriend a tall, colourful flightless bird (whom Russell names “Kevin”) trying to reach her chicks, and a dog named Dug, who wears a special collar that allows him to speak. Carl and Russell encounter a pack of dogs led by Alpha, and are taken to Dug’s master, who turns out to be an elderly Charles Muntz. Muntz invites Carl and Russell aboard the “Spirit of Adventure” where he explains that he has spent the years since his disgrace searching Paradise Falls for the giant bird. When Russell notes the bird’s similarity to Kevin, Muntz then becomes hostile, prompting the pair to flee with Kevin and Dug. Muntz catches up with them and starts a fire beneath Carl’s house, forcing Carl to choose between saving it or Kevin. Carl rushes to put out the fire, allowing Muntz to take the bird. Carl and Russell eventually reach the falls, though Russell is disappointed in Carl over his decision to abandon Kevin. Settling into his home, Carl looks through Ellie’s childhood scrapbook; finding photos of their happy marriage added into it, along with a note from Ellie thanking him for the “adventure” and encouraging him to go on a new one. Reinvigorated, he goes to find Russell, only to see him sailing off on some balloons to save Kevin. Carl empties the house of furniture and possessions, lightening it, and pursues him. Muntz captures Russell, but Carl manages to board the dirigible in flight and free both Russell and Kevin. Dug defeats Alpha and become the dogs’ new leader. Muntz pursues them around the airship, finally cornering Dug, Kevin, and Russell inside Carl’s tethered house. Carl lures Kevin out through a window and back onto the airship with Dug and Russell clinging to her back, just as Muntz is about to close in; Muntz leaps after them, only to snag his foot on some balloon lines and fall to his death. The house then descends out of sight through the clouds. Carl and Russell reunite Kevin with her chicks, and then fly the dirigible back to the city. Carl presents Russell with his final badge: a grape soda cap that Ellie gave to Carl when they first met and made their promise. The two then enjoy some ice cream together. One of the best things about the film is that Carl Fredrickson is the spitting image of a friend of mine, a chap called David Chapman. As time went on I had to collect the Princess Mia from school, something I always love to do. We strolled back and chatted about school and what she would like to do that afternoon. One thing we had to do was visit Aunt Ciss – not a real aunt but the best friend of the mother of the lady of the house. 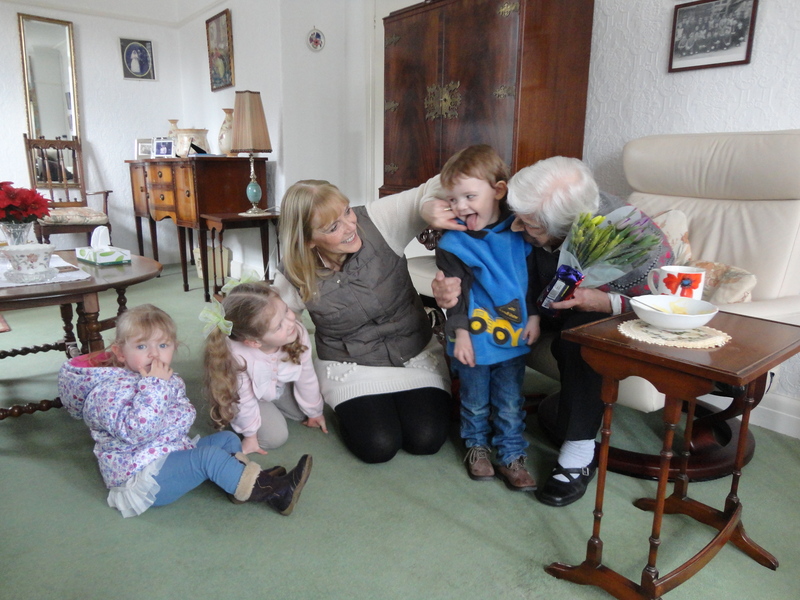 Ciss never had children of her own and so the lady of the house has given Ciss a card and present for the past 45 years – without failing once! It’s an incredibly kind thing to do. I know how much Ciss appreciates it and thinks of my dear one as the daughter she never had. 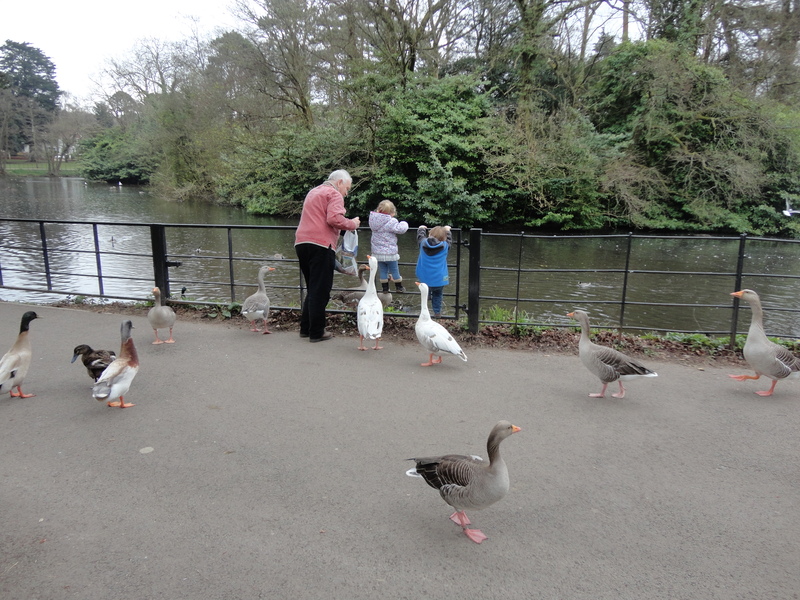 On the way we decided to stop at Roath Park to feed wildlife. 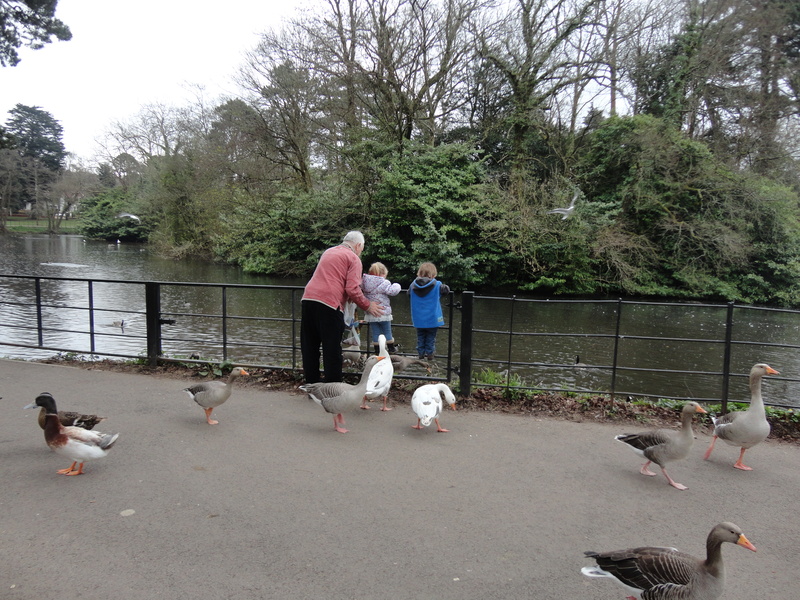 Roath Park stands in a beautiful location at the centre of Cardiff. 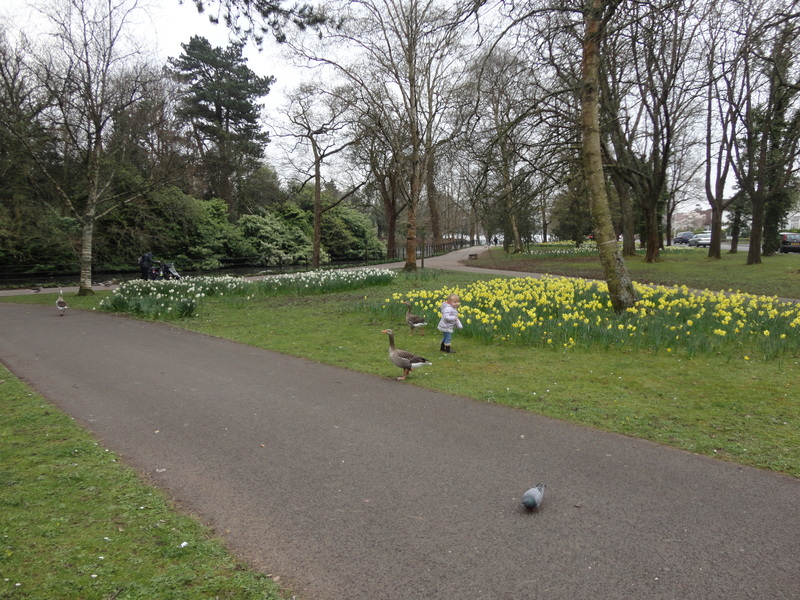 The park still retains the classic Victorian Park atmosphere where local residents and visitors alike can enjoy their leisure time in many different pursuits. 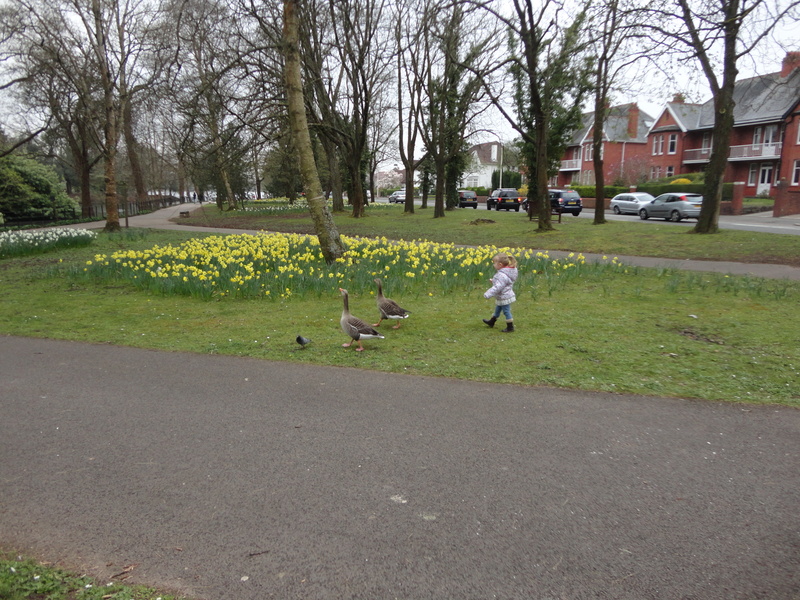 The land for Roath Park was donated by the Marquess of Bute to the city in 1887. Work initially focused on creating the lake from an area of marshland. A lighthouse was constructed in the lake containing a scale model of the ‘Terra Nova’ ship as a memorial to Captain Scott who sailed to the Antarctic from Cardiff in 1910. The park’s atmosphere today still retains the Victorian elegance and its status as a Conservation Area ensures these qualities will be protected. There is a wide range of habitats in the park, which attracts a diverse variety of wildlife. The lake acts as an important habitat for over wintering and breeding birds, including mallard, cormorants and herons. 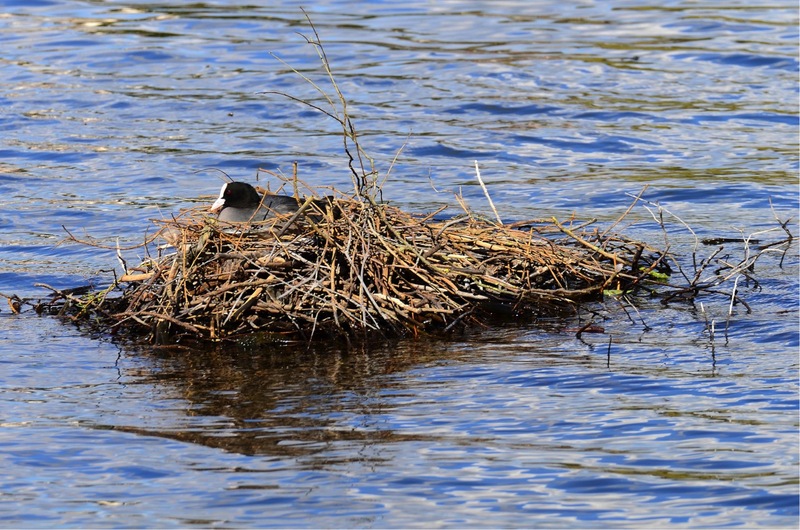 Islands within the lake also act as safe nesting sites. 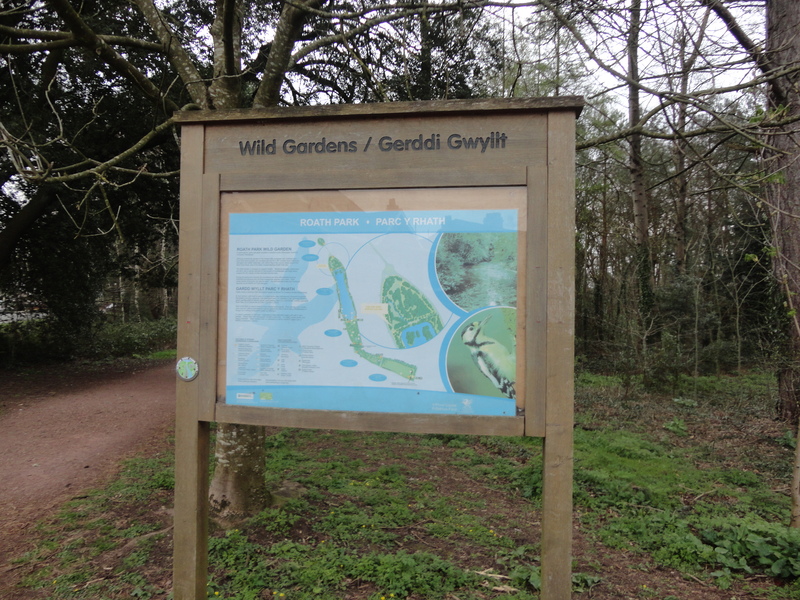 There is a wildflower garden included in the park where the area is managed to encourage wildlife and native species. 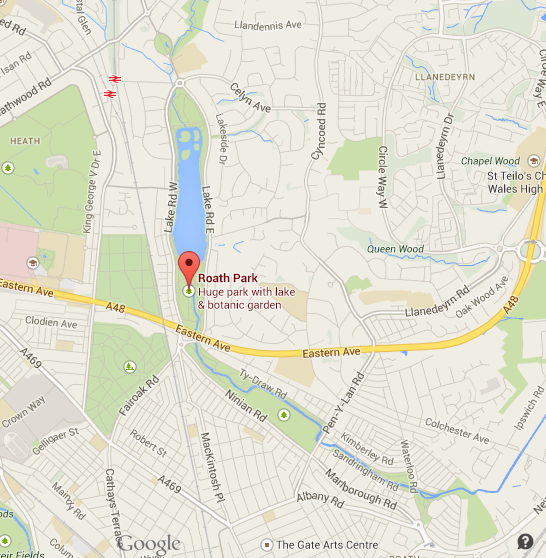 The most interesting thing about the park is it stretches from The Oval, just past Cardiff High School then follows the Roath Brook, Nant Fawr from north to south; The Wild Gardens, Roath Park Lake, Botanical Gardens, Rose Gardens, Pleasure Gardens, Roath Park Recreation Ground, Roath Brook Gardens, Roath Mill Gardens and Waterloo Gardens. It’s a huge swathe of green land in the heart of our city. 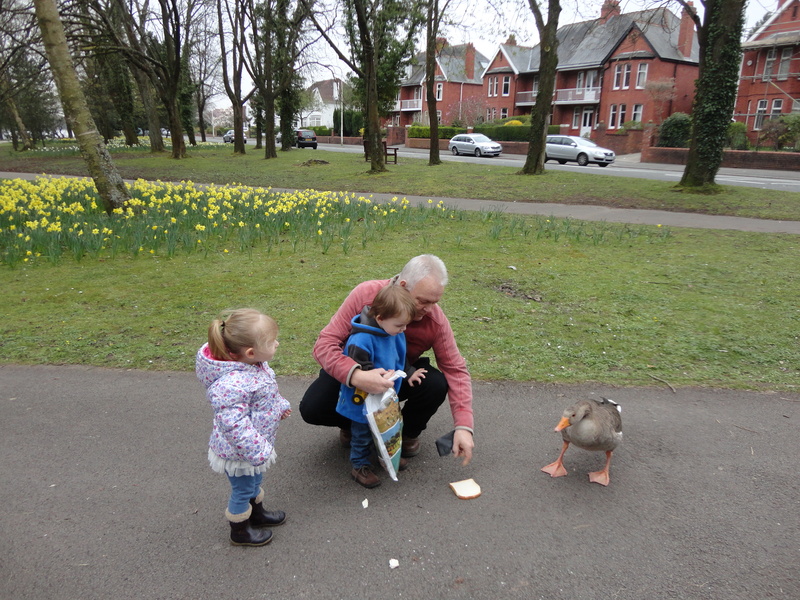 As we arrived it started raining, but we did what we could to feed the birds. 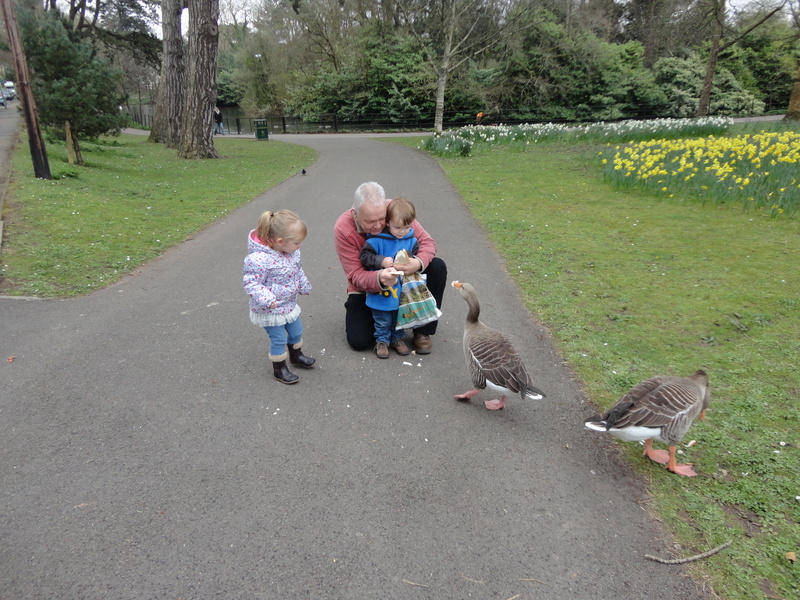 They were all a little bit nervous at first – the children not the birds – but as they watched me they all became a little braver. 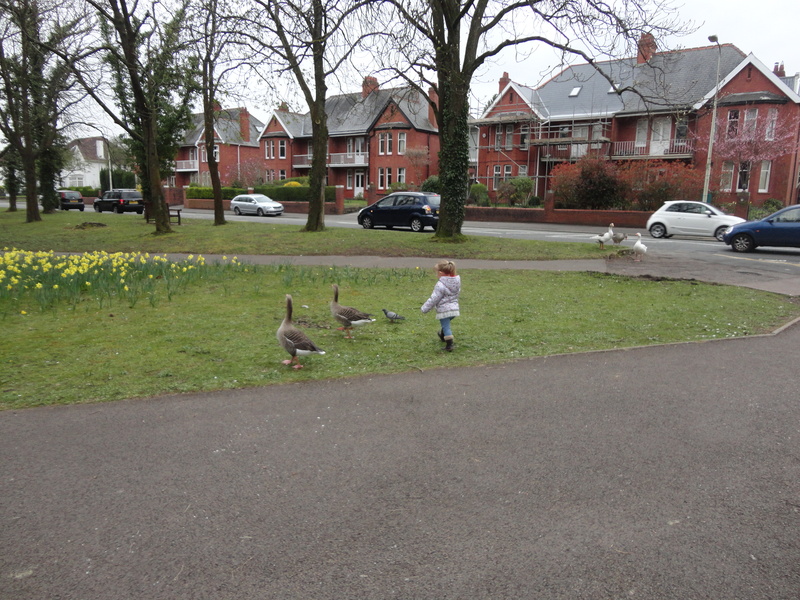 Millie in particular was fearless and ended up chasing the geese around. 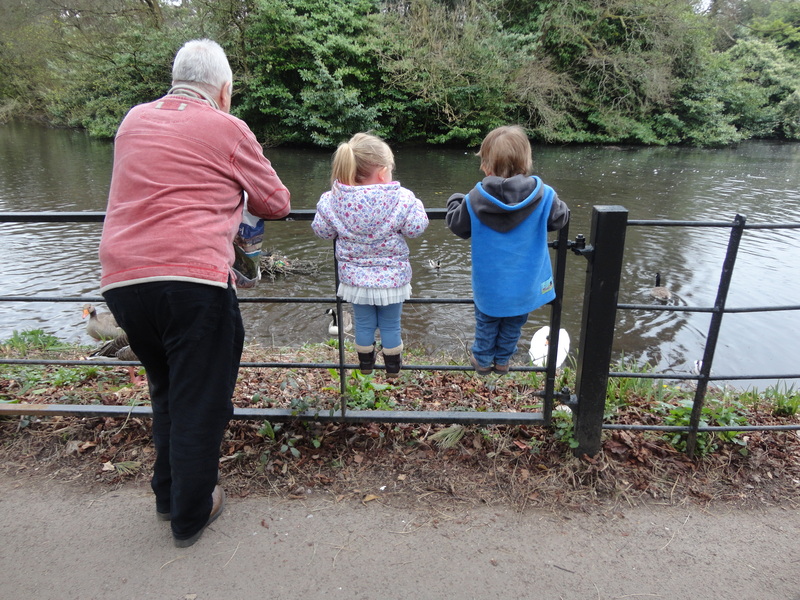 We strolled around and then went and stood on the railings, looking at the birds. We noticed a coot, which had built a beautiful nest out in the safety of the water. The kids loved it. 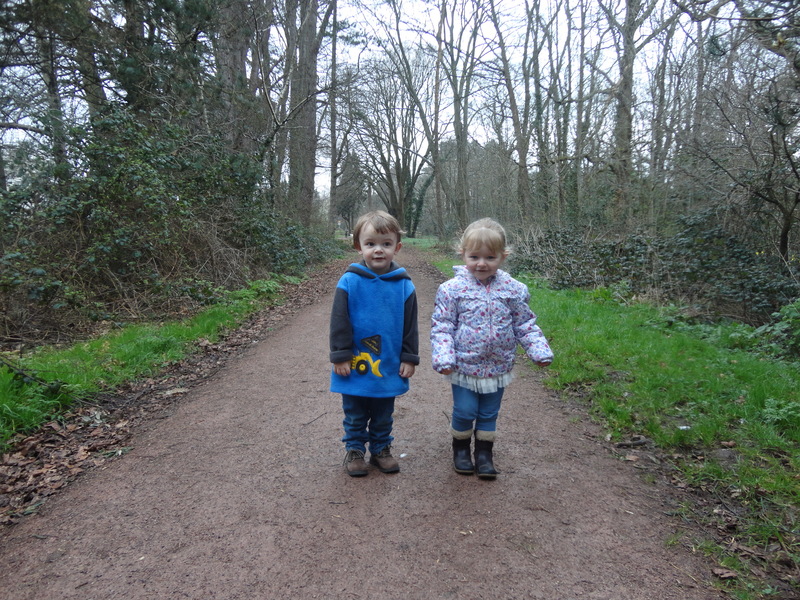 After a while Alfie Millie and I strolled through the Wild Gardens while Mia and the lady of the house sheltered in the car. 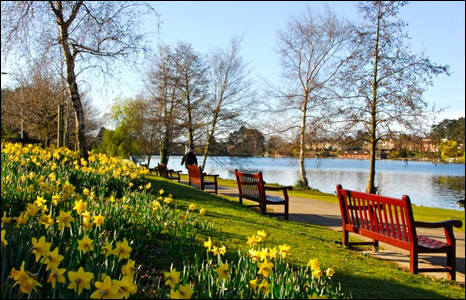 The Wild Gardens is the area to the north of the Lake, which was to be a second lake in the very first plans for the Park. That idea was abandoned on the grounds of expense. In June 1894 when the Park opened, this area had not been developed. Shortly after, in September 1894, a public shelter was built, and this was followed in 1895/6 by the creation of footpaths and two bridges over the brook. Apart from these additions the Wild Gardens retained much of its original state with indigenous trees, plants and wild flowers and that is how it is to this day. The shelter has long gone but the area is still very natural and very peaceful. 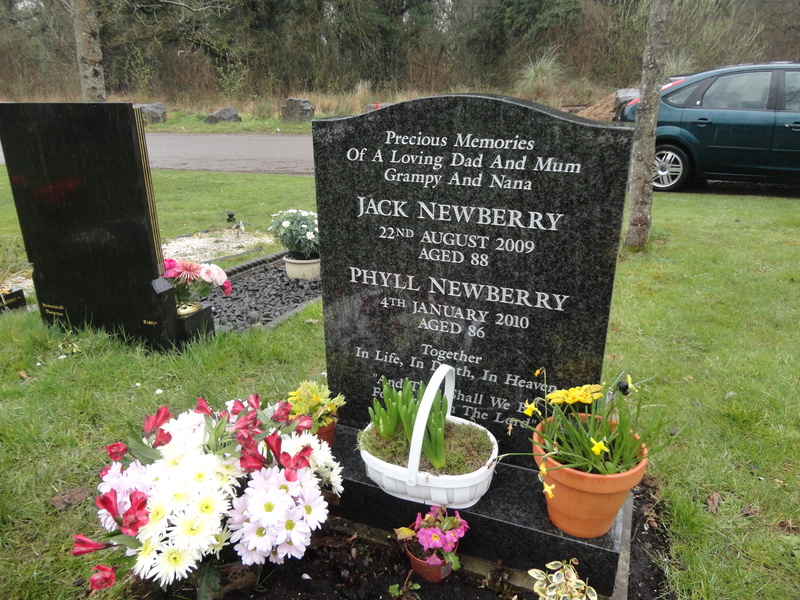 From here we moved on to visit my mum’s grave; we had not been able to visit the day before, which was mothers day. We were hoping that Mia. 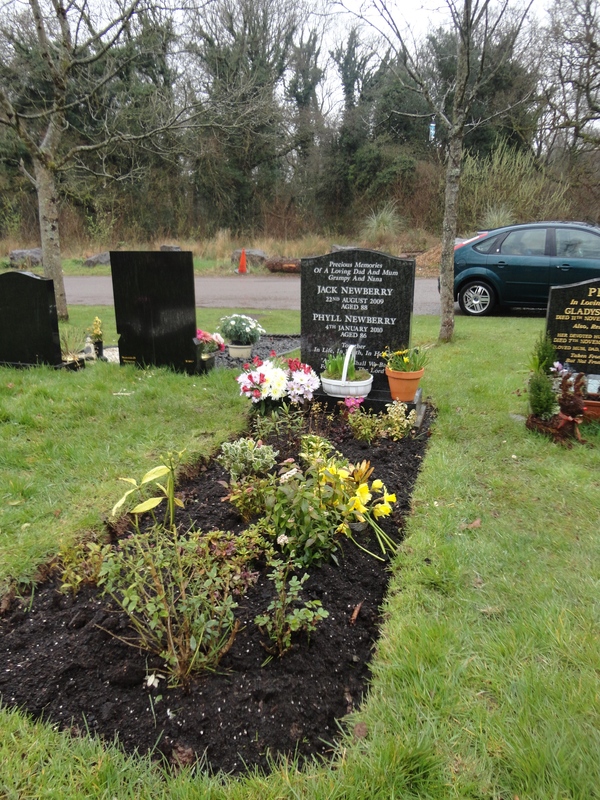 Alfie and Millie would put the flowers on but the rain was chucking it down. 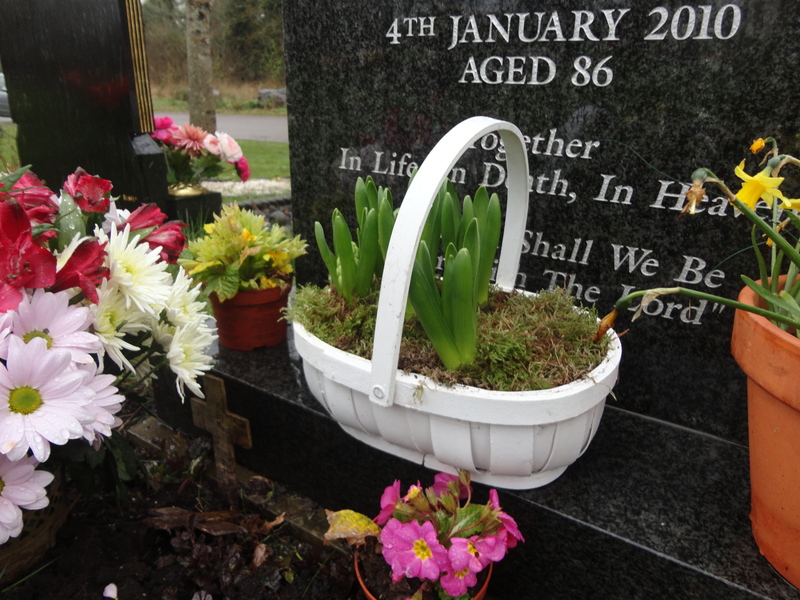 We had bought a beautiful basket of spring bulbs. 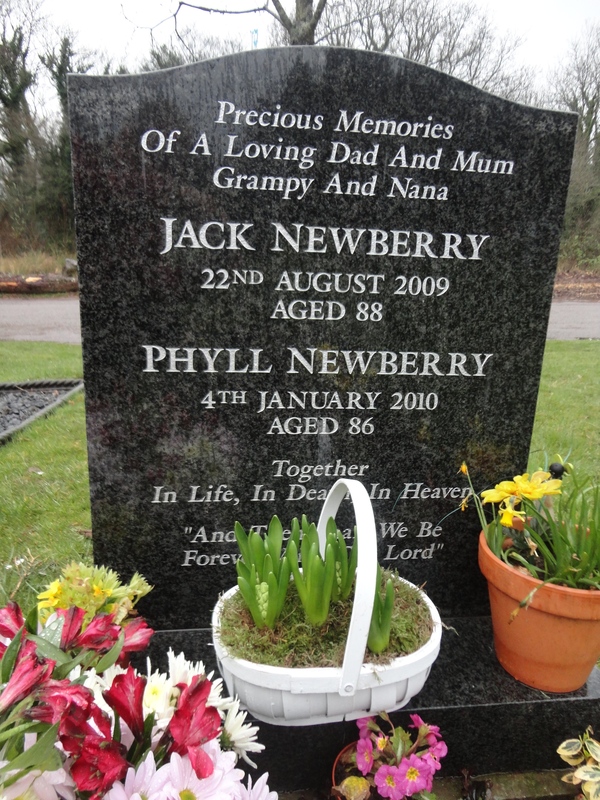 My mum LOVED flowers. I was thrilled that the grave looked so good. Obviously my brother had been hard at work – he is so kind and caring like that. Cissie is 93 year old and lives alone. 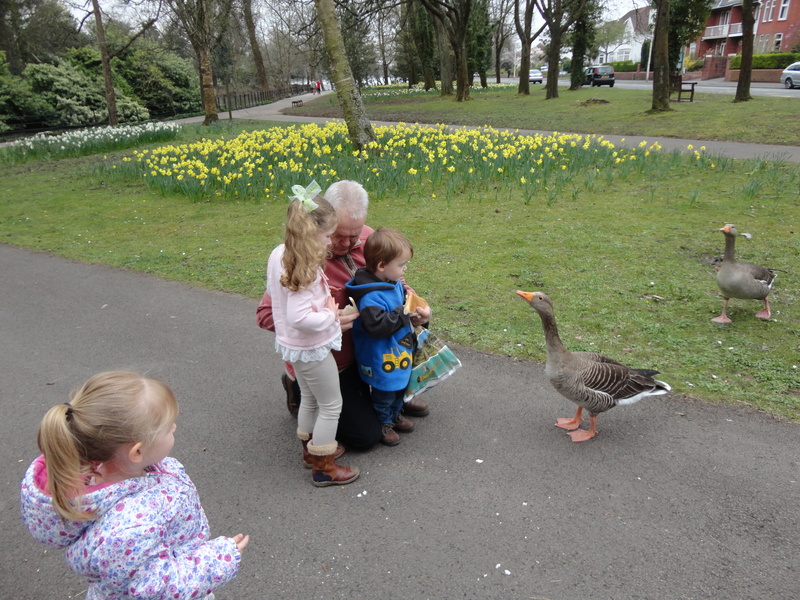 She was delighted to see us and especially the kids. 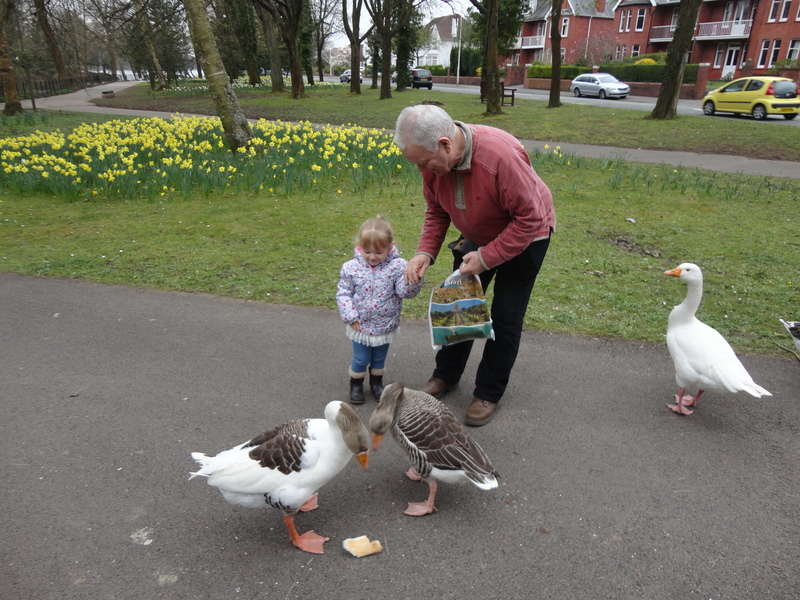 They were great with her and her friend who had come to visit. 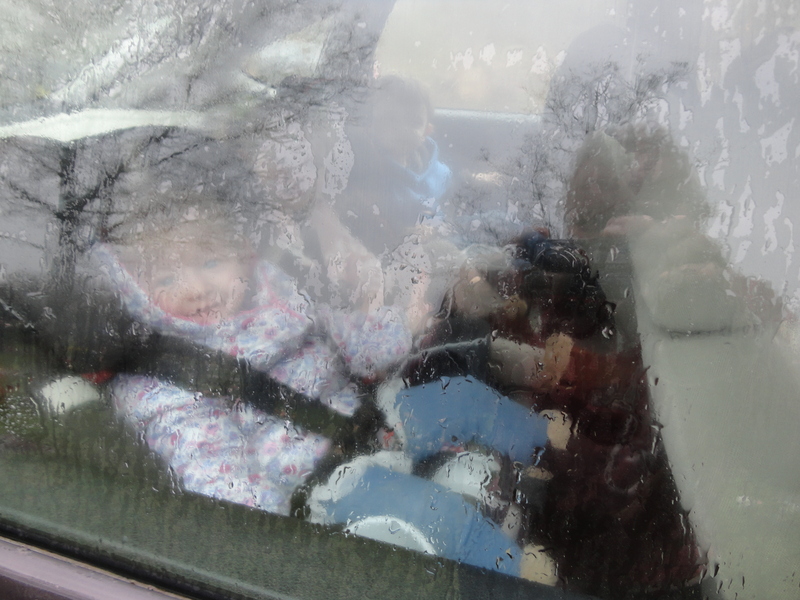 After about an hour it was time to go home and the kids were bundled, giggling into the car and by the time we reached home all three were heavy eyed and happy. It was so good to be together and to be at home. What a lovely day out. 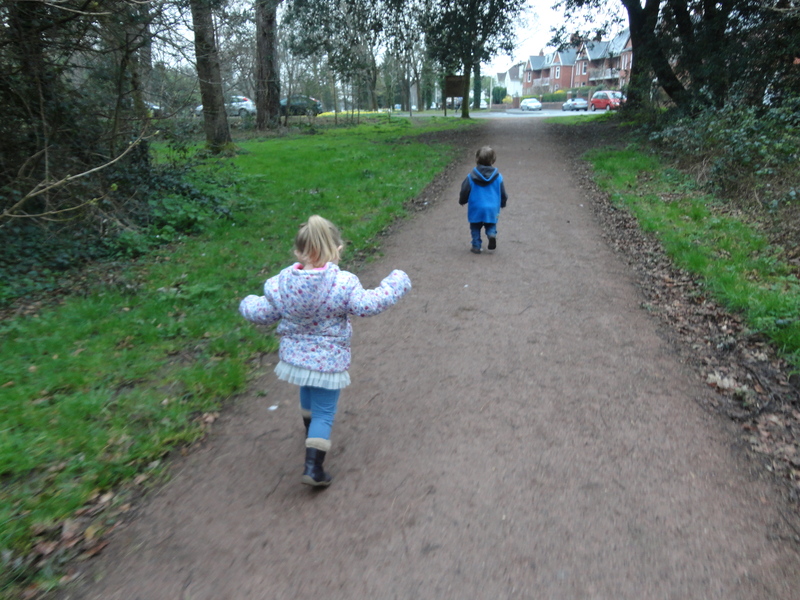 Roath park never disappoints.